These seedlings will be planted on the roof as soon as it stops raining. Bust the farmer's market myth. A year after opening, Panera’s pay-what-you-want café proving successful. The U.S. Department of Agriculture is preparing to approve a new strain of genetically engineered drought resistant corn. New rules usher in a tasty comeback for Cuban food. For functional foods it's all about the marketing. Nice, the CDC confirms lemon eucalyptus oil can be as effective as DEET in repelling mosquitoes. What!? Would-be cannibal arrested after gunbattle in Slovakia. Is there meat glue in your food? To shame food safety violators, China allows press more freedom to investigate. 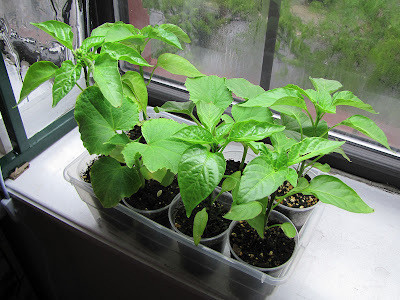 Are those your sweet pepper plants? I planted the pepper seeds you gave me and can't wait until they are as big as yours. Yup, 3 King Crimson and 2 Atris sweet peppers, 1 lemon cucumber and 2 Tasty Bite cantaloupes. I'm just waiting for the rain to stop so I can plant them.